Is there a stranger you never met but still think about from time to time? What made you notice them? 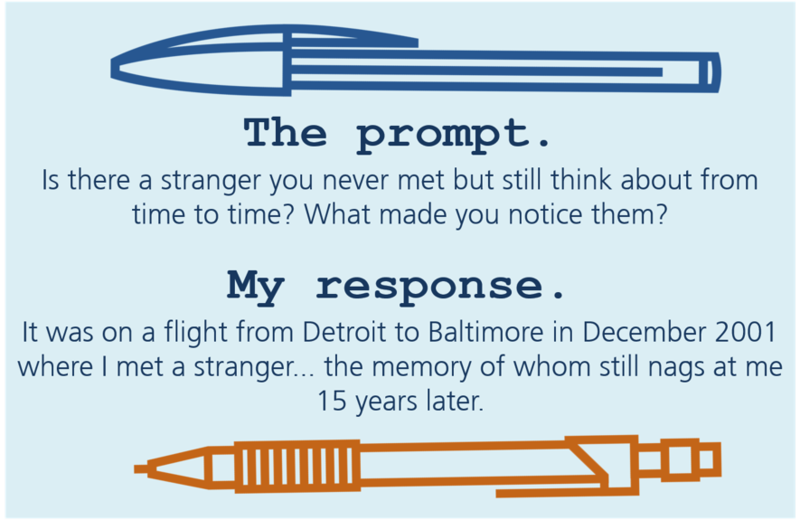 It was on a flight from Detroit to Baltimore in December 2001 where I met a stranger… the memory of whom still nags at me 15 years later. Three months post-9/11 was a weird time to be on an airplane. A lot of people were still not comfortable flying. Plus it was mid-week, so the flight wasn’t full. There seemed to be a strange sense of camaraderie amongst passengers. Exhausted from my workdays in Detroit, I smiled and half-listened to the chatter going on around me. One particular guy was holding court with several women around him. I listened to his jokes and laughter. Noticed that he probably had more vodka tonics than a flight from Michigan to Maryland warranted. As we deplaned, I ended up standing behind him. We briefly chatted during the endless shuffle while other passengers ahead of us gathered their detritus. He was visiting Baltimore and somehow the subject of small towns came up. I made a comment about the misery of my teenage years. He countered with, “I bet the town I grew up in was much worse.” “Oh yeah? Where was that?” I humored him. I gasped, “Oh my gawd! Are you serious?! I grew up in Fredericksburg!” He stared at me for a moment. “Where did you go to school?” I quickly asked. The line was beginning to move. My heartbeat sped up. “North or South?” I asked. “South,” he answered. “HOLY CRAP! Me too!” I really couldn’t believe this. “What year did you graduate?” I excitedly asked. I’m stumped. I knew a Karl in high school but this was certainly not him. “Oh gosh… I’m so sorry, I’m drawing a blank…” Before I can finish my sentiment he’s walking away from me and hugging someone who has come to pick him up. I never saw him again. And I never figured out who he was. I analyze that random, chance meeting sometimes. I couldn’t find him in the yearbook. My graduating class was a couple hundred and, sure, it’s possible that the guy could have just attended for part of his senior year and I never met him or heard his name. That’s really the most likely scenario. And the truly amazing part of all this is that two people who graduated the same year from a somewhat rural area in Virginia would meet on the same flight in another state. But something nags at me. What if “Fredericksburg, Virginia – South Stafford High School – Class of 1991” was some kind of cover story? What if he was traveling on an assumed identity and picked details that he was sure would never be an issue? And the REALLY, truly amazing part is that something happened which could only happen in a movie. He ran into someone who made those details a problem.